Photo courtesy of New Hampshire Liquor & Wine Outlet. It’s impossible to capture the interior of Liquor Store #66—situated just off Interstate 93 in Hooksett, New Hampshire—in a single photo. Not even a horizontal frame; not even two. It takes the sweep of the camera’s panorama setting to take it all in. Yes—the same setting you might use to photograph a mountain landscape. That’s how massive a hunk of real estate this liquor store is. And it’s only one of a pair. Liquor Stores #66 and #67 lie on either side of the interstate. Each building also contains a mall–rest stop that incorporates a neon-lit diner beneath a cloud-painted ceiling, a souvenir store, and a host of other small businesses—by design, there’s not a McDonald’s or Dunkin’ Donuts in sight. It seems unlikely that a network of state-run liquor stores would generate much excitement; they’re so generic, they don’t even have names, just numbers. Yet industry liquor blog Breaking Bourbon named New Hampshire the number three state for buying bourbon, and the New York Times even profiled one of the stores as a travel destination. How did these state-run retail outlets generate such buzz? In addition to the stores’ tax-free status and mammoth inventories, New Hampshire has invested in an advertising pilot program, public relations, and education outreach efforts. 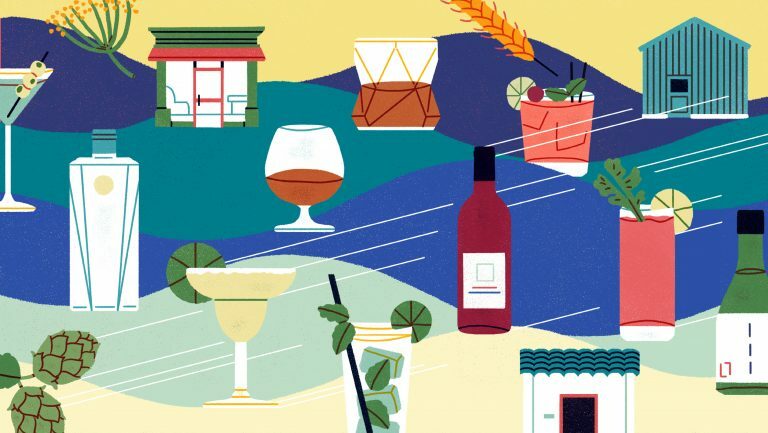 The New Hampshire Liquor Commission (NHLC) even hosts an annual Distillery Showcase spirits tasting, along with ancillary events like a splashy dinner featuring a flight of Pappy Van Winkle bourbons and (new this year) a Bourbon & Chocolate pairing experience. While instant name-brand recognition may still be far off, the NHLC has come a long way from its modest, post-Prohibition beginnings in 1934, when the first store opened in Manchester. New Hampshire is also the only control state that operates liquor stores—and sells that liquor tax free. That means that New Hampshire draws a significant amount of out-of-state business. It’s an unusual business model. More than half of sales at these gargantuan retailers comes from out-of state-customers, the NHLC confirms. About a quarter comes from neighboring Massachusetts alone. The NHLC stores have been deliberately located to encourage cross-border business transactions. Glance at a map of store locations, and it’s easy to see that they’re densely clustered along the southeastern border of the state, entry points for Massachusetts and the southernmost part of Maine, plus a few more along the less populous Vermont border to the west. NHLC stores also dot Interstate 93, the major highway that runs north-south through the center of the state. Big, Bigger, Biggest . . . The selection of spirits in these enormous, well-stocked outlets is impressive and adds to the allure of the relative cheapness of tax-free booze. Since 2012, the NHLC has spent $200 million renovating the stores, the agency says. Already, 27 of the state’s 80 existing outlets have been renovated. The stores are getting bigger, operating hours are expanding, and the product list is increasing, too. 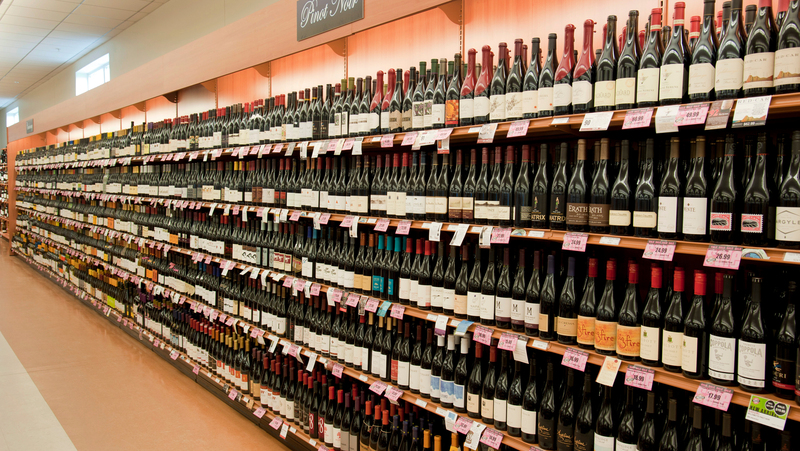 About 7,400 wine SKUs are sold each year overall, plus almost 3,000 spirits SKUs. The dual Hooksett Welcome Center shops are a prime example. Each 20,000-square-foot outlet is double the size of the store that preceded it. 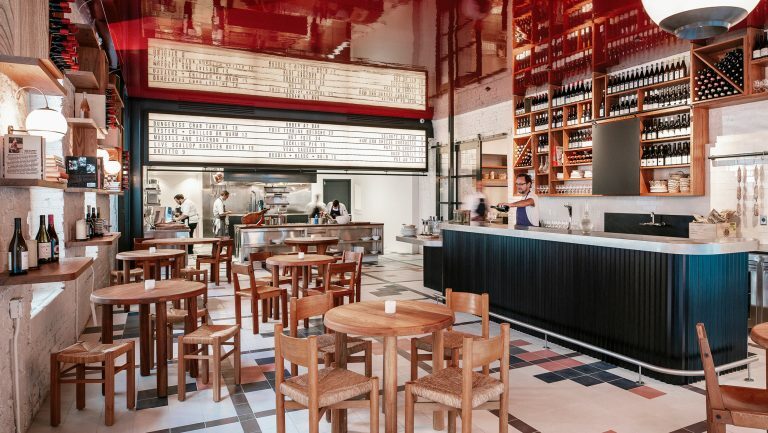 These behemoths opened in 2014, allocating ample space for long stretches of shelves devoted to vodka, whiskey, tequila, and rum; promotional displays; and trophy cases full of rare bottlings. The recently opened Nashua NHLC outlet—the state’s top-selling store that’s not located on a highway—is a 32,000-square-foot facility that includes a state-of-the-art kitchen where area chefs are sometimes brought in to explore options for pairing wine, spirits, and food. To be clear, “big” doesn’t necessarily equal “comprehensive,” especially when it comes to spirits. The Hooksett stores, for example, sell “tons of whiskey, vodka, rum, and tequila,” the agency says, while gin is a slower seller and, as a result, is less well-represented in Hooksett and other NHLC outlets. Meanwhile, the shelves bear very little in the way of mezcal, Japanese whisky, or vermouth. Cognac is well represented, though Armagnac and Calvados are harder to find. 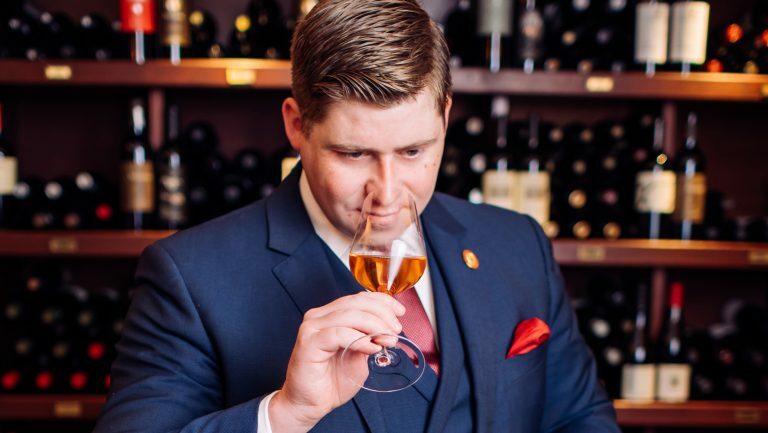 That said, offerings vary from store to store, and what’s not seen on overloaded shelves—like Armagnac or aquavit—can often be special-ordered. Across all the stores, top sellers are generally 1.75 milliliter handles; as of December 2017 the list (posted here and updated monthly) included Absolut Vodka, Bailey’s Irish Cream, Captain Morgan Spiced Rum, Crown Royal, and Dewar’s White Label. The top 50, for both in-store and on-premise sales, are typically made up of big, mainstream names. As might be expected, the on-premise sales list includes more value brands (Barton Vodka, El Caballo Gold Tequila) in well-friendly 750-milliliter and 1-liter bottles, dotted with local names (Allen’s Triple Sec, made in Maine) and the occasional eyebrow raiser (Zhenka Tropical Dark Rum, which rum critics seem to have no kind words to describe, weighs in at #33 for on-premise sales). Meanwhile, local spirits from all over the New England area are on the NHLC shelves in force: Boston Harbor Maple Cream, made in Boston; Sea Hagg Rum, made in North Hampton, New Hampshire; a 100-percent corn bourbon from Smoky Quartz Distillery, another New Hampshire producer—to name just a few. “We have a low barrier to entry for [such] products to come in,” Mollica explains. Producers pay a $100 processing fee plus annual license fees ($720 for those producing less than 200 barrels; $1,920 for those producing more than 200 barrels). One way the NHLC uses its scale is in its “barrel buy program”; it purchases single barrels, especially from whiskey distilleries, and showcases them as exclusives in the stores. While New Hampshire is hardly the only state to have access to single barrels, its purchases certainly do stack up. In April 2017, reps from NHLC purchased a combined 62 individual barrels of Tennessee whiskey and bourbon from the Jack Daniel’s, Woodford Reserve, Buffalo Trace, Wild Turkey, and Jim Beam distilleries. It was the largest individual purchase of single-barrel whiskey in the state’s history. This year NHLC outlets sold 750-milliliter bottles from the barrels at prices like $26 for Buffalo Trace Single Barrel Bourbon, $45 for Jack Daniel’s Single Barrel Select Tennessee Whiskey, and $55 for Wild Turkey Russell’s Reserve Single Barrel Bourbon. The effort seems to be paying off: The NHLC has seen bourbon sales increase to $25.3 million in fiscal year 2017 from $17.9 million in 2014, an increase of more than 40 percent. The commission credits the expansion of the barrel buy program, as well as increased interest in bourbon and whiskey in New Hampshire, for that rise. 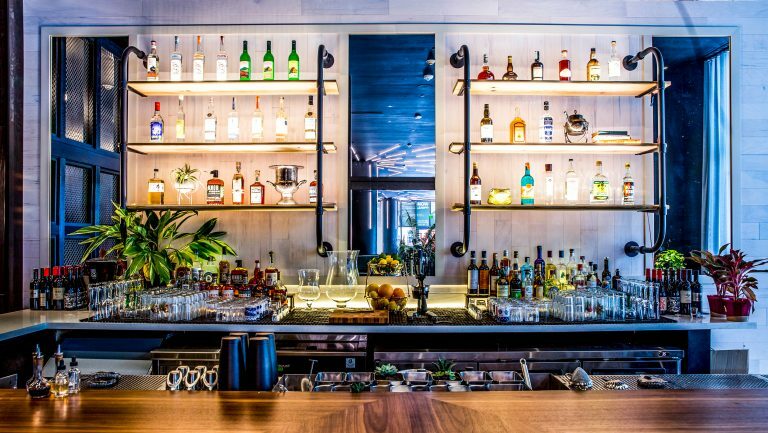 In addition to being sold at the NHLC stores, some of the spirits from the barrel program are sold at a handful of select bars and restaurants. For example, at the Hanover Street Chophouse (HSC) restaurant’s Manhattan Bar, bourbons on offer from NHLC barrels are marked as “HSC” bourbons. Although bespoke whiskey barrels remain a hot line item, exclusives for other spirits are coming too. For example, earlier this year, the NHLC purchased nine barrels of aged tequila, Mollica confirms. 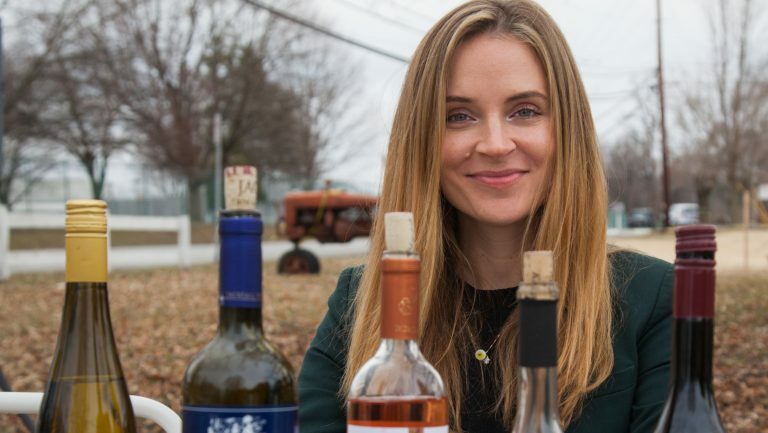 Similarly, New Hampshire Wine Week, an annual event held in January that’s organized by the NHLC, brought 50 producers to Manchester this year, including well-known names such as Gallo and Banfi. “In some cases, [producers] bring in allocations they won’t give anywhere else,” notes Nicole Brassard Jordan, NHLC director of marketing, merchandising, and warehousing. 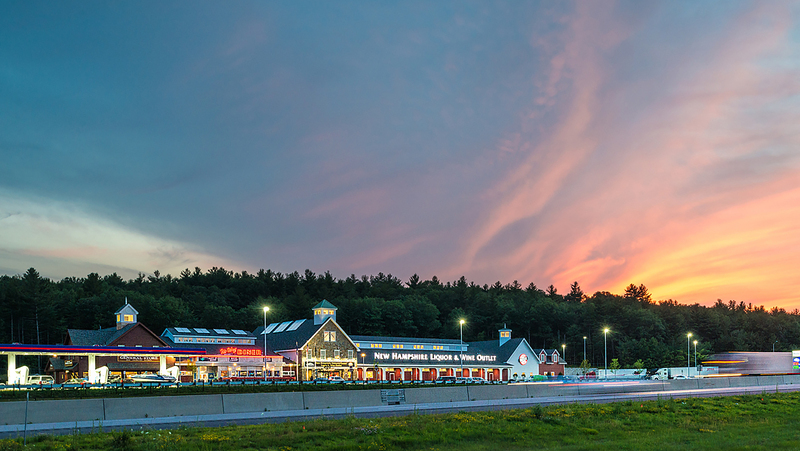 New Hampshire may not yet have the name-brand recognition of a national chain, but it clearly has what it takes to entice customers across state lines—namely, deep discounts (on top of tax-free status), the barrel program, and sprawling retail spaces in several prime locations. Talk to those who regularly vacation in New England and you’re sure to hear reminiscences of stopping in New Hampshire outlets to load up on boozy buys. Just don’t expect to see photos of those stops—at least, not photos neatly contained in one frame.